On Dec-9, a German court issued an injunction against sales of the Apple products in Germany. 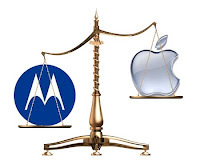 The court announced its ruling on one of the patent infringement lawsuits Motorola Mobility brought in Germany against Apple in Apr-2011. The Mannheim Regional Court also ruled that Motorola is entitled to a damage reward. Battle between the companies shouldn't be something new for our readers.